Playfulness. Inspiration. Community. When these things combine, they make a powerful combination, a triple threat of goodness. If I can find them all in one place, you can bet I’ll try to get there. And so explains my hankering for thrift stores. Maybe you share the same infatuation. (Is yours enduring, too? Oh thrift stores, I’ll always love you.) Or maybe you just need a break from whatever stress is on your mind. Either way, welcome to my new series: Thrift-Shop Hop. When I’m in a different city or exploring my own, I’ll seek out second-hand stores. I’ll invite you along as I discover stories they have to tell. I’ll find items that may spark an upcycling project or two. Or else the treks will simply be amusing, which is just as good, I say. See? I hope you’re amused already. Junket intersperses works from local artists throughout. Here’s one such cheeky surprise. When I stepped into Junket, I could tell it was set up by somebody who cares. It was just a feeling I got, but evidence quickly followed. Arrangements featured handmade signs, many which suggested ideas for DIY types like me. Thread arranged by color made me want to reach out and grab spools by the rowful. Dont get me started on the medley of snarky teacups. You’ll have to visit Junket yourself to see them in all their spiteful glory–yes, coffee mugs are included, too–but I’ve provided my favorite here. I’m snickering even as I type about it. Okay, y’all, let’s just put it out there: Junket’s a community-supporting superstar. First of all, free coffee and donuts greeted me at the door. This made sense given its pedestrian-friendly, local-business-championing neighborhood, but still. This show of openness was a nice touch. Another example of local support was the mosaic artist positioned by the door. (I was too shy to take pictures.) Working on one of his creations, he chatted with those who stopped by. A few of his pieces appeared in the store. Though I didn’t realize it at the time, there’s an empty wall in my craft room that really should have this beauty hanging on it. Oh, man. I wonder if it’s still there. Here’s a Little Free Library at the Lake Elmo Park Reserve, which is 10 minutes from my house. I love that this one was an Eagle Scout project. The official site describes them as boxes “full of books where anyone may stop by and pick up a book (or two) and bring back another” to share. Each is a standard size, but all are different and reflect the style of whoever put it up. I’ve seen them in residences and at businesses. Of course I grabbed a basket of my own. For months I’ve had a project in mind that requires transforming Altoid tins, so I snapped up a couple. Four projects on my list will likely come first, but I’ll get to it. Really, I will! If I can achieve what’s in my head, those tins’ll give me a good way to encourage friends going through a tough time. Those of us who sew are notorious for having stashes of fabric. 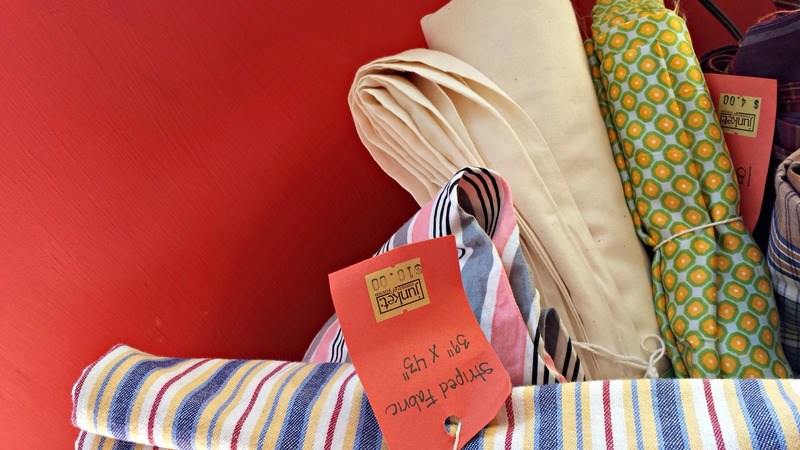 I’m no exception, though I make a strong effort to buy fabric only for each project at hand. That said, when I came across a basket of remnant bundles, I saw a silky scrap that caught my eye. So. 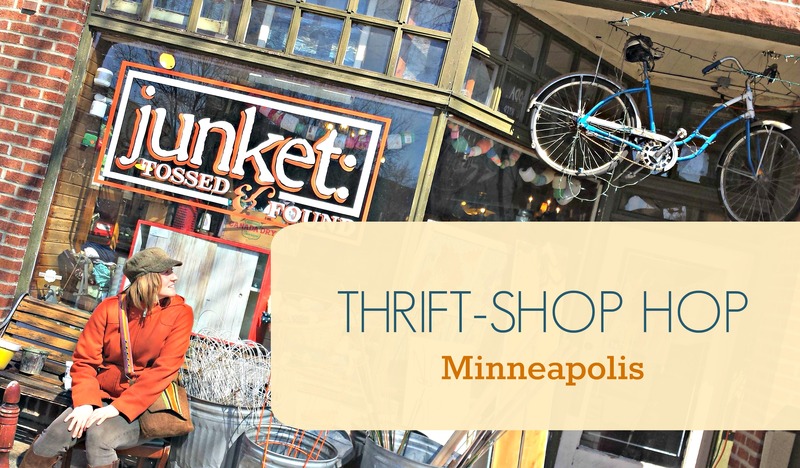 . . what treasures are you finding at thrift stores? Leave a comment and let me know. When’s the last time you had a conversation with an inanimate object? For me, such talks often involve cursing, but not this time. No, this is a story of a happy chat, one where the thing spoke to me, not the other way around. I was browsing men’s suits at my local Savers when one decided it had something to say. It knew who I was, clearly, and it didn’t waste any time. Yes, that’s one of THE pockets, right there in the center, all giant and cool. 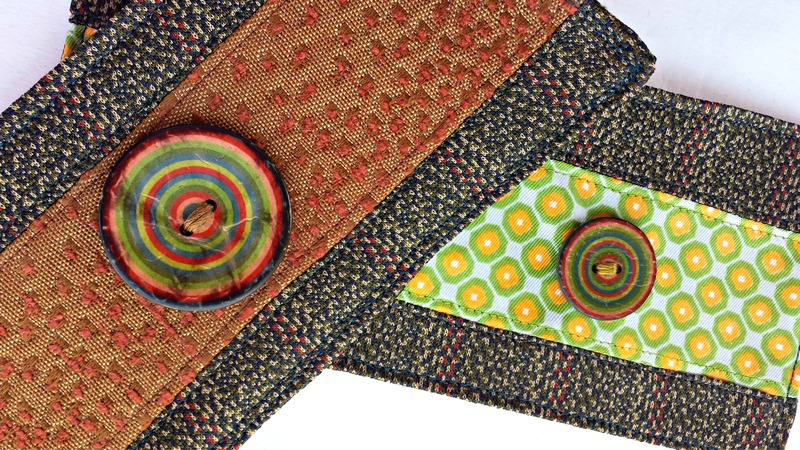 Only now, it features custom embellishments involving a sweet button and an upholstery scrap from my stash. 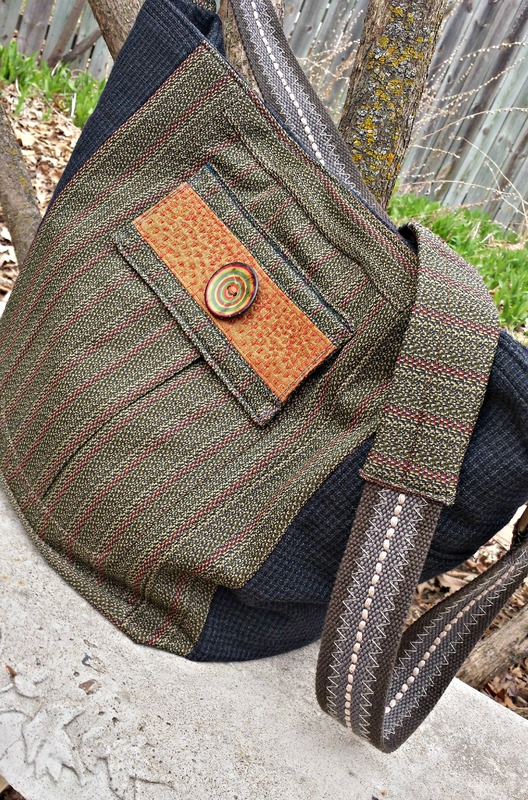 You know how this story ends: I did make a bag, and I love it. Getting from vision to bag, though, was harder than I thought it’d be. I knew what I wanted to do, but first I had to figure out how. I searched for a pattern that fit my vision, one that would let me feature two contrasting suits and a belt for the strap. 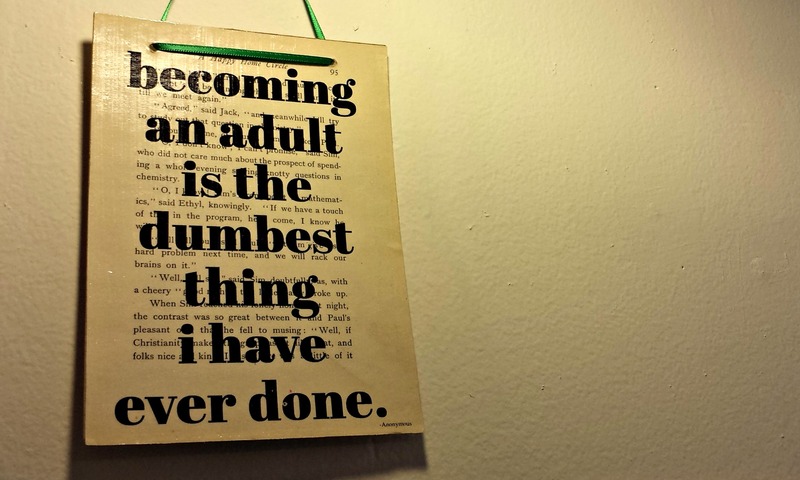 After finding a series of near misses, I admitted what I’d known all along: I would have to wing it. And so it began. Through the weeks that followed, I spent mornings, evenings, and weekends tinkering. I cut into the jackets. I reshaped their fabric into rectangles and strips. I pieced them together to suit the bag living in my mind (ha, ha). I tested interior fabric (called interfacing) to influence structure. I sewed pieces together. I ironed their seams. 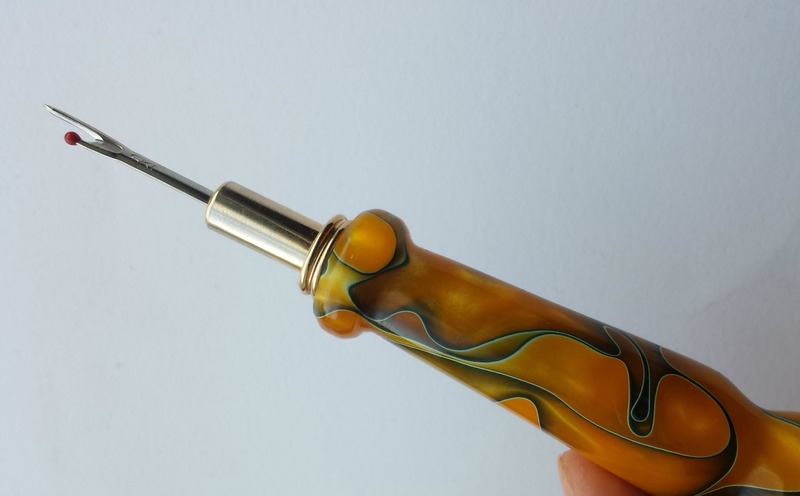 Then, when something wasn’t right, I got out my seam ripper and took them apart. I bought a second one while making this bag, as I needed it nearby at all times. Seriously. I used those darned seam rippers at every step. Every. Single. Step. Along the way I wondered, more than once, why I was spending so much time on just one bag. Cursing at inanimate objects became a regular occurrence. But here’s the thing: Every hour I spent was an hour that got me closer to making something new. This was a chance to put something on this earth that wasn’t there before. This bag is huge! You can put anything in here! If you’re a maker, you know the feeling of getting lost in your craft. You’ve lived the journey of getting inspired, starting, slogging, reworking, walking away, coming back, toiling, seeing, believing, then finally–sometimes, anyway–finishing. Now here’s the part where I get to play fangirl to another of my favorite podcasts. Do you want to hear a description of the making process that’s so eloquent you just may cry? Of course you do. Get yourself immediately to Jonathan Fields’ Good Life Project. There you’ll find his beautifully crafted installment, “How Working with Your Hands Changes You.” If I had a glass, I’d raise it to all you creators out there. Instead I have a laptop and a cat on my lap. P.S. 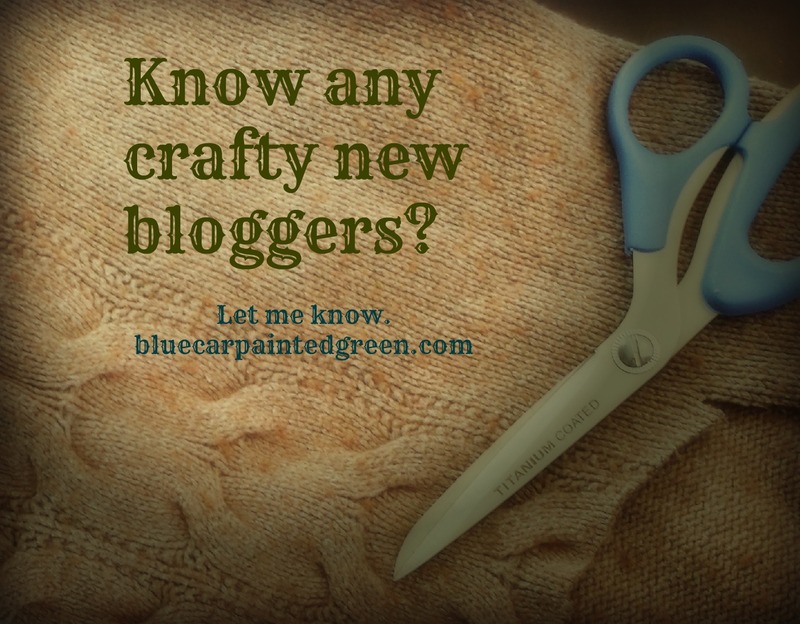 : Are you a crafty blogger looking for a link-up? Try The Casual Craftlete, Merry Monday. or Coastal Charm. “Sometimes life needs a makeover.” So says the mission page of Enchanted Makeovers, and I couldn’t agree more. Improving tired things–from Savers suits to my own life–is what this blog is about. So when my favorite sewing podcast introduced me to Enchanted Makeovers, I was intrigued. Stephanie Kendron, host extraordinaire of Modern Sewciety, got choked up when asking her listeners to support the organization. I can easily see why. Since 2007, Enchanted Makeovers’ mission has been to transform homeless shelters for women and children. The goal is create places that inspire behavioral and psychological change. During her interview, founder Terry Grahl described what it’s like to redecorate the rooms. She builds a homey atmosphere by setting up sewing spaces and adding handmade linens. When asked how others could help, said dolls were in particular demand. I decided to participate but wasn’t sure what to make. A few days later the question was answered for me as I walked past a second-hand bookstore. The window display featured a collection of sewing-project books. Of course I had to go in and scope them out. Minutes later I was flipping through Sock and Glove, filled with plans for how I’d turn a pair of socks into a cutie stuffed elephant. I liked that this was a way to upcycle socks that may have grown a little thin. I was psyched, but it took me a few weeks to sit down and do it. Once I did, I was relieved the instructions were easy to follow. 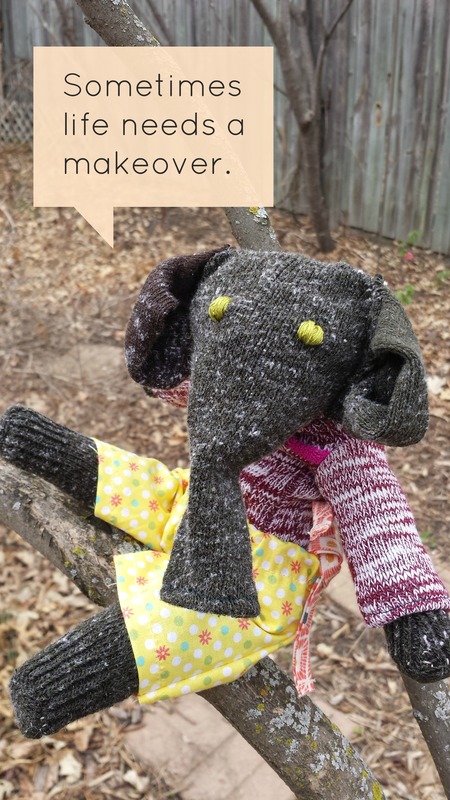 I had fun seeing the elephant come together. Piece by piece, I glimpsed this little gal coming to life. As you can see, my snuggly thing’s heading to the mail tomorrow. I hope she brings comfort, wherever she may land. If you happen to have what I’ll call “package-labeling OCD,” then please accept my sincere apologies for this photo. 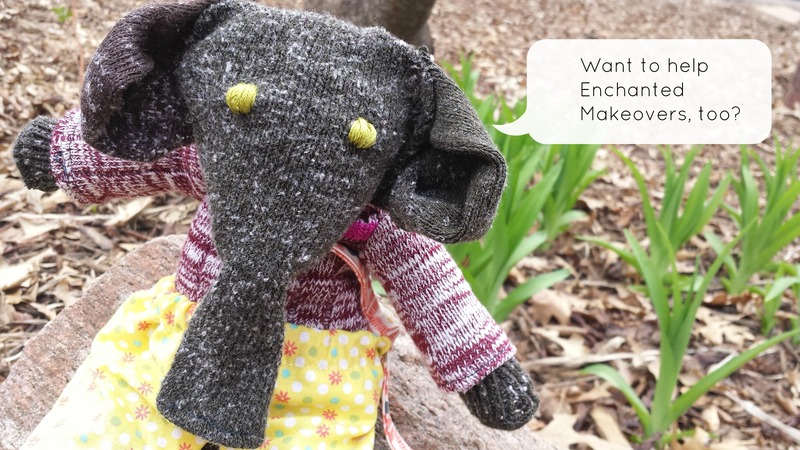 If you want to create something special for Enchanted Makeovers, here’s how you can help. Even if sewing’s not your thing, there are plenty of ways to contribute, such as monetary donations, blog posts, or hosting a fundraising party. Feel free to comment and let me know if you participate. Have fun! Hello, my lovelies. I enjoy a good crowd-sourcing project, so today I’m asking for your help. Do you know any creative types who are new to blogging? (Maybe even you!) I want to write a post featuring their sites, so kindly comment here with a link. Don’t be shy. Feel free to link to any blog you think I’d want on my radar. This includes makers of all types–photographers, cooks, musicians, poets, DIY aficionados, and of course, upcyclers. Ideally their blogs have fewer than 200 followers or are in their first year. Happy searching, everyone!